Yes, it really is a table. What, How, Why. Newest Samples! Updated 13 January, 2010.
most amazingly great URL, periodictable.com. Current count: 2379 samples, 118 elements, 471 minerals, 14 stories, 1711 rotatable images, 1536 smooth rotations, 78 videos, 47 sounds. Buy my beautiful photo periodic table. My photographic periodic table poster! My museum displays and element sales. My 2002 Ig Nobel Prize in Chemistry. Oliver Sacks came to visit! Buy a copy of my new book THE ELEMENTS or a photo periodic table poster or card deck! Posters up to four and half feet wide, laminiated place mats, 3D prints, and now a huge card deck! job both scientifically and artistically." Click any element to see more. This website documents, in great depth, a large collection of chemical elements and examples of their applications, common and uncommon. Click any element tile above and you will find probably more than you ever wanted to know about that element. All these samples (well, at least the ones that fit) are stored in a wooden periodic table, by which I mean a physical table you can actually sit at, in my office at Wolfram Research. I decided to build this table by accident in early 2002, as a result of a misunderstanding while reading Uncle Tungsten by Oliver Sacks. I won't bore you with the details here (see the Complete Pictorial History of the Wooden Periodic Table Table), but once it was finished I felt obligated to start finding elements to go in it (because under the name of each element in my table there is a sample area). Then I started building a website to document all my samples, and that's when things really got out of hand. A few months later my little table won the 2002 Ig Nobel Prize in Chemistry, clearly the highest honor for which it is eligible. Sensing an audience, I began to take the website more seriously, which led to my being asked to write a monthly column for Popular Science magazine, which I've now been doing continuously since the July 2003 issue. Later I formed a most satisfying partnership with Max Whitby building high-end museum displays, selling element samples and sets, and filming video demonstrations of the chemical properties of the elements. This website now contains the largest, most complete library of stock photographs of the elements and their applications available anywhere, as well as a large and growing collection of 3D images documenting hundreds of samples rotated through 360 degrees. Try clicking on some elements in the table above: I think you'll be surprised what's lurking behind those little tiles. You can buy a copy right now! My new book THE ELEMENTS is out! 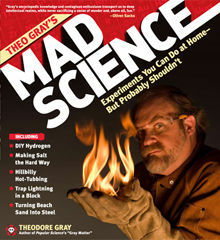 My older new book MAD SCIENCE is also available! Berkelium, Beryllium, Bismuth, Bohrium, Boron, Bromine, Cadmium, Calcium, Californium, Carbon, Cerium, Cesium, Chlorine, Chromium, Cobalt, Copper, Curium, Darmstadtium, Dubnium, Dysprosium, Einsteinium, Erbium, Europium, Fermium, Fluorine, Francium, Gadolinium, Gallium, Germanium, Gold, Hafnium, Hassium, Helium, Holmium, Hydrogen, Indium, Iodine, Iridium, Iron, Krypton, Lanthanum, Lawrencium, Lead, Lithium, Lutetium, Magnesium, Manganese, Meitnerium, Mendelevium, Mercury, Molybdenum, Neodymium, Neon, Neptunium, Nickel, Niobium, Nitrogen, Nobelium, Osmium, Oxygen, Palladium, Phosphorus, Platinum, Plutonium, Polonium, Potassium, Praseodymium, Promethium, Protactinium, Radium, Radon, Rhenium, Rhodium, Roentgenium, Rubidium, Ruthenium, Rutherfordium, Samarium, Scandium, Seaborgium, Selenium, Silicon, Silver, Sodium, Strontium, Sulfur, Tantalum, Technetium, Tellurium, Terbium, Thallium, Thorium, Thulium, Tin, Titanium, Tungsten, Ununbium, Ununhexium, Ununoctium, Ununpentium, Ununquadium, Ununseptium, Ununtrium, Uranium, Vanadium, Xenon, Ytterbium, Yttrium, Zinc, Zirconium, Actinium, Aluminum, Americium, Antimony, Argon, Arsenic, Astatine, Barium.